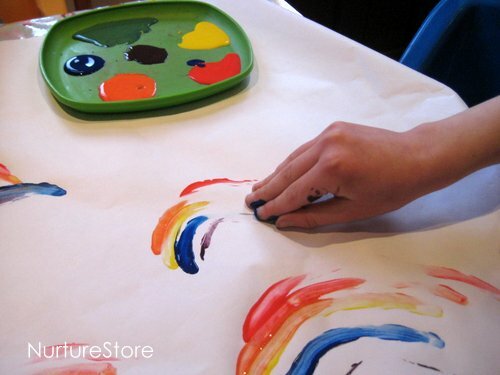 We use a shallow plate when we’re finger painting, so we can set out a variety of colours for the children to try. Giving everyone their own palette lets them paint away without any squabbles. Today we added in a colour mixing experiment, combining red and yellow to make orange, blue and red to make purple and yellow and blue to make green. Magic! We tried out two different ways to make our rainbows. 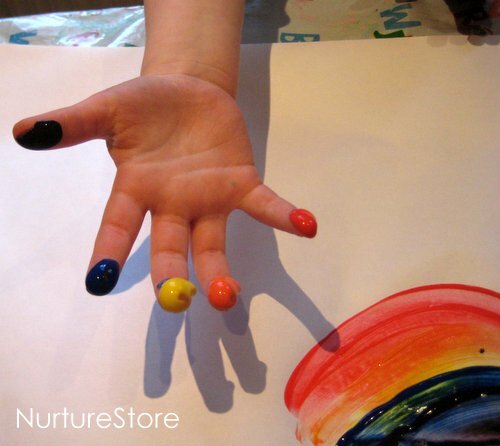 The first technique we tried was to put a blob of paint onto each finger to make a rainbow with one swipe of the hand. 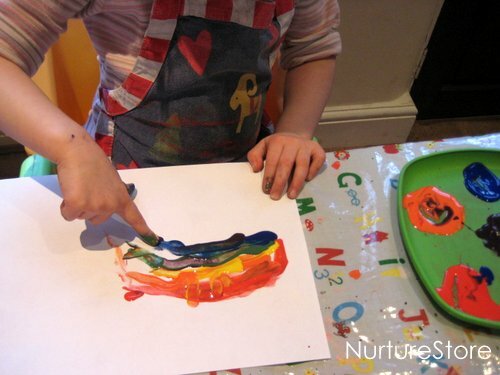 With the fingers held close together you can then make a rainbow arc on your paper. Great swooshy fun! 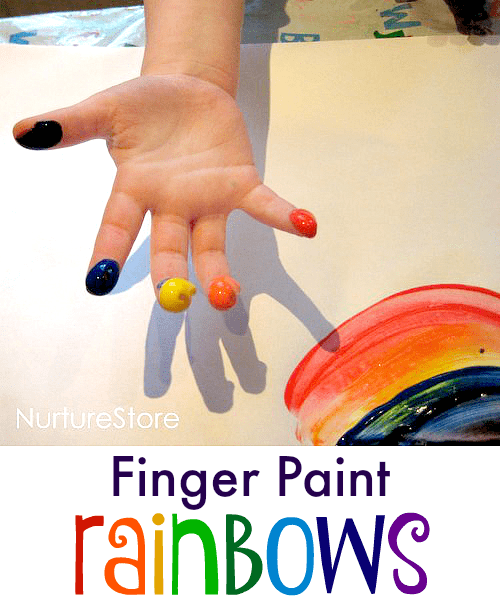 As an alternative, especially if your have younger children, you can also use one finger at a time, building up your rainbow stripe by stripe. The children could make as many rainbows as they like on a big sheet of paper that you could use as a table cloth, or cut up to make bunting. 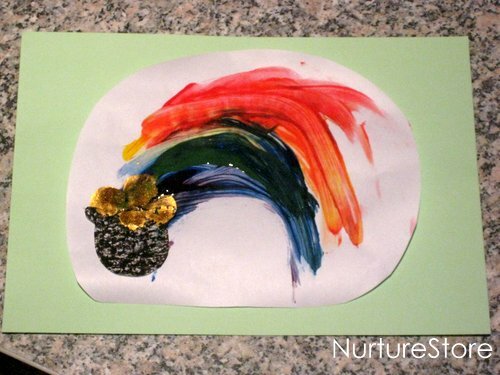 Or cut out your rainbows, stick them on to a piece of card and add a black pot and some gold finger-painted coins and you have a great card to celebrate St. Patrick’s Day. Simple and sweet! Thanks for sharing! I know what you mean – lots of celebrations and festivals around now. My husband’s family is from Dublin so we do try to remember this one! SOOOO smart and cute!!! Love it all! oh how lovely! I love painting with the kids but keeping them at the table and the paint out of the rest of the house is such a challenge! oh rainbows just make me happy! What a clever idea! Such a cute idea! My kids would get a kick out of this, I’m sure! Put a Rainbow in your Tummy, I love this idea. My daycare kids love crafts that link up with snack ideas (we always have snack after craft time). Thanks for the cute idea, we’ll be trying it out next week. Cathy – these are wonderful! 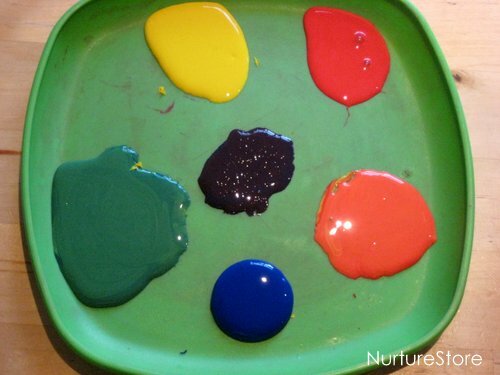 Thank so much for linking up and sharing your colorful fun!